Diana Bishop is an American academic based at Oxford University, she is also a witch. Through her specialism in the History of Science she encounters a mysterious alchemical manuscript, known as Ashmole 782, which displays strong magical powers. As Diana has a severe aversion to using her witchy skills, she sends the manuscript back to the stacks, much to the chagrin of all the other witches, vampires and daemons in the vicinity, who don't believe that things are that simple or that she's so ignorant. Matthew Clairmont, a charismatic scientist who also happens to be a 1500 year old vampire is the first creature on the scene and although Diana has been warned she can't help herself from being drawn in. I'm not going into any further detail as I dislike giving spoilers, but also it's such a huge book (almost 700 pages) I couldn't possibly do it justice and okay, I'm going to 'fess up and declare that this is my new guilty pleasure! I LOVED it!! I know I probably shouldn't and that there's many more worthy books out there and although it isn't perfect, I've given this 5 stars because I loved the whole indulgent experience! It's pure entertainment and I know I'll have to by the sequel in hardback as I won't be able to wait beyond the summer. I see this novel as a wish-fulfilment for all the more mature readers of the twilight series, who felt a smidgen bad for being way too old to lust after Edward (go, on...I know you did, we've talked about this at work!) and have struggled to hide their guilty secret! 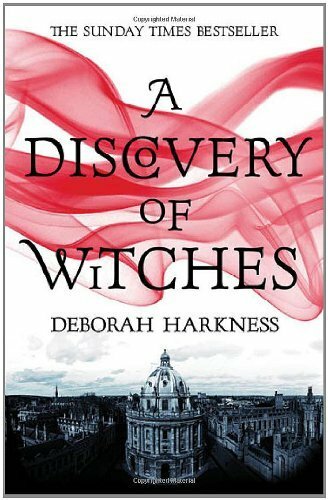 Deborah Harkness has given us a gorgeous, but definitely more age appropriate vampire with even more back story and hidden depths - yay! As anyone who has read my previous reviews I do like my flawed, tragic but devastingly handsome heroes (who cares if it's a cliche?!) and Matthew ticks all the boxes, he's even a wine fanatic which allowed me to forgive him being a yoga bunny! Diana is mildly irritating (which at least allows the female reader to feel superior as they'd be far cooler in the same situation) but she did grow on me as I became more involved in the story. She does need rescuing too often, (although who can blame her with Matthew around?) and the whole denial of her witchiness was a bit grating and seemed a bit teenagey-angst for a woman in her mid thirties. However, she does become more interesting as her abilities develop. I know I'm gushing, and I accept it's not going to be for everyone, but it's an atmospheric, indulgent fantasy read that made me very happy and I can't wait for the next one! Following you now from over at Goodreads! Nice blog!